This post contains affiliate links. I may receive a small commission (at no expense to you!) If you make a purchase after clicking an affiliate link. Thank you for supporting my blog! When spring and summer are right around the corner but no one has told the thermostat you need something to crochet to cheer you up and keep you warm - introducing Crochet Cotton Throws and Beach Blankets! 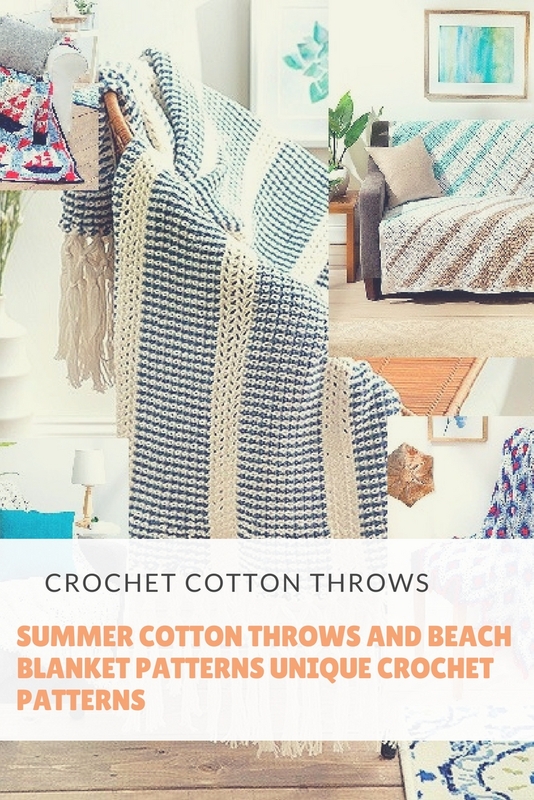 Crochet Cotton Throws and Beach Blankets feature 6 lightweight projects perfect for indoors and out! Accessorize your home with warm weather throws that you can easily crochet in bright, white, or tranquil colors using soft cotton yarn. There are six designs to crochet that offer a variety of unique styles and a great variety of looks. The Reversible Look to this Crochet afghan gives it a unique look and a fun pattern that looks great on either side. This White lightweight afghan is perfect for cuddling up on a cool summer evening. Sail away with this fun crochet afghan pattern featuring sailboats on a blue background. Crochet a Fun Striped Afghan Perfect for the beach or outdoor use! An Easy to Crochet Corner to Corner Afghan to Make using Summer Beach Colors! Perfect for summer lounging, the designs in Cotton Throws and Beach Blankets from Leisure Arts provide just the right touch of light comfort for warm days. Choose from six styles that are easy to crochet using cotton yarn; five feature medium weight yarn and one is crocheted using fine weight yarn. Designs include Diamonds by Kathryn Clark, Summer Style by Carole Prior, Sailing by Martha Brooks Stein, Slanted Stripes by Cheryl Riley, Reversible by Nancy Griffin, and Striped (with triple-knot fringe) by Judith Harris. Crochet them in bright, white, or tranquil colors of soft cotton yarn to accessorize your home with a great variety of looks.